Join lookthinkmake for an open house where we'll show off the brands of some of Austin's favorite places. We'll have work to see, swag to share, and snacks to enjoy. 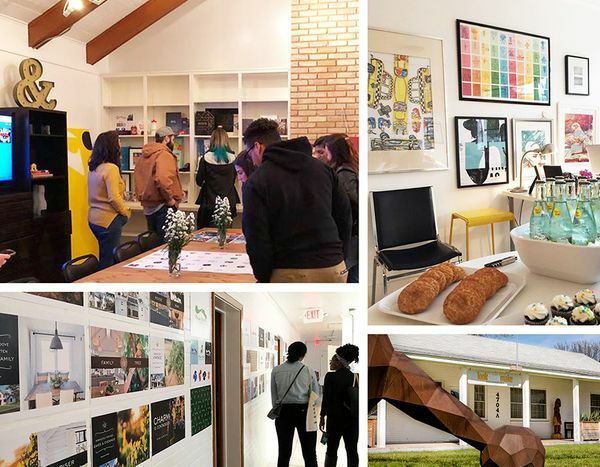 At lookthinkmake, we're opening our doors to the community during Austin Design Week to showcase our work in community-based design: arts, architecture, destinations, neighborhoods, and nonprofits. From individual samples to broad multi-year campaigns, we’ll show work from the past ten years (we're turning 10 this November), offer tours of our studio, share some fun swag, and celebrate with some local snacks and beverages. Our office will be staffed with our creative teams, as well as our publicists and brand managers, all eager to talk about our work and show off our space. We'll have several rooms dedicated to displaying our digital and print work, as well as open offices for an inside look at our agency. lookthinkmake is a full-service design, advertising and public relations agency. We thrives on design ideas and approaches that bring the community together, and this November we’ll be celebrating our 10th year of helping brand places that Austin loves. From branding city districts and neighborhoods, to designing for arts, parks, architecture, destinations, and tourism, we champion the connection between people, and the places and spaces they want to be. By creating and supporting brands that welcome people in, we strive to open doors all over Central Texas; Barton Springs Conservancy, Pease Park Conservancy, The Austonian, The Independent, Art Alliance Austin, The University of Texas at Austin, Preservation Texas, and Fareground at One Eleven are just a few of the clients we have served.